GP-121 – Egg Elegance No. 4 – Stitched on Zweigart’s Vintage Pink Whisper in shades of orchid, aqua and sand. 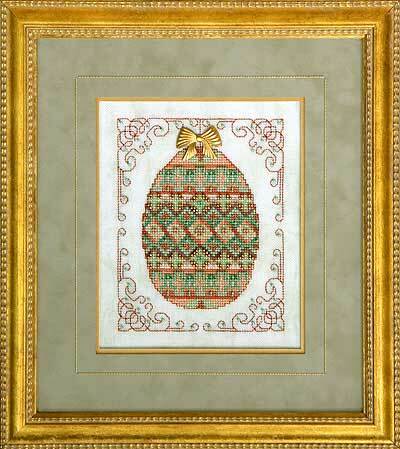 Fabric: Stitched on 28 count Antique Green (Item #3281/6159) Vintage Cashel Linen by Zweigart. Materials Summary: A total of 12 Anchor colors used in model. DMC comparable (best match) colors are provided in chart. Chart includes brass bow embellishment.